having one of those days are we?? That is too cute. 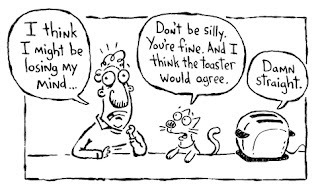 How nice of the toaster to agree. WE sure hope you have a great day and thanks for the laugh. Take care. Thank Cod the toaster agreed. That could have gone either way. hehe - thanks for giving us a laugh today. We always enjoy your Tuesday Toons! We really should go visit the site, but we probably would never leave. PS My human is so in love with your furs! Ha ha ha -- we laffded and laffded! You Shoebox Peeps are pretty funnies, says my Human.